Polar amplification is the greater temperature increases in the Arctic compared to the earth as a whole as a result of the effect of feedbacks and other processes It is not observed in the Antarctic, largely because the Southern Ocean acts as a heat sink and the lack of seasonal snow cover. It is common to see it stated that “Climate models generally predict amplified warming in polar regions”, e.g. Doran et al.. However, climate models predict amplified warming for the Arctic but only modest warming for Antarctica. Many discussions about polar amplification around the climate-related blogosphere have similar definitions, leading readers to believe polar amplification is a phenomenon that only occurs in a warming world. 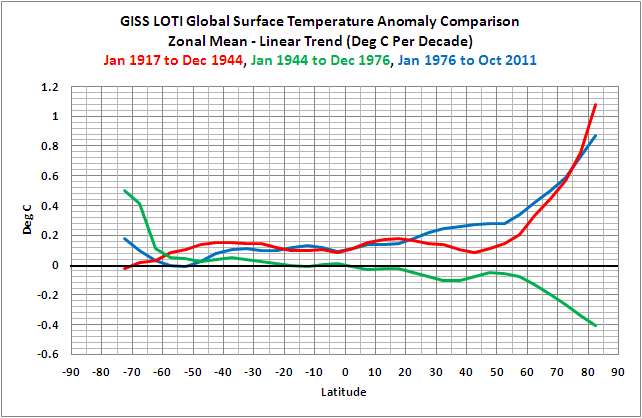 But if we divide the trends of the global surface temperature anomaly data since 1917 into its cooling period (1944-1976) and two warming periods (1917-1944 and 1976-2011), and present the surface temperature linear trends on a zonal-mean (latitudinal) basis, Figure 1, we can see that polar amplification works both ways. That is, during a period when global temperatures cool, like 1944-1976, there is greater cooling in the Arctic than elsewhere. Note also that, according to the GISS Land-Ocean Temperature Index (LOTI) data, the rate at which the Arctic warmed was higher during the early warming period (1917-1944) than it has been during the current warming period (1976-present). If you’ve never seen a zonal-mean plot before, they’re not difficult to understand. The y-axis (vertical) is temperature in deg C, just like a time-series graph. But the x-axis (horizontal) is latitude, with the South Pole to the left at -90 degrees and the North Pole to the right at 90 degrees. 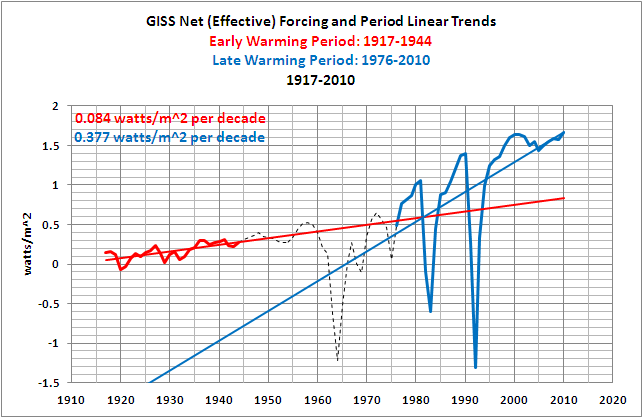 In Figure 1, and in the other zonal-mean graphs in this post, we’re illustrating trends in deg C per decade. Note: I have not included any data south of 75S (the Antarctic) because the data there starts in the 1950s and it is sporadic early on. Many of you will find it odd that global surface temperatures warmed at such similar rates during the early and late warming periods—especially when we consider that the net effective forcings during the late warming period rose at a rate that’s about 4.5 times greater than during the early warming period. See Figure 2. The GISS net forcing data is available here. That’s one of the ways the surface temperature record contradicts the hypothesis of anthropogenic global warming. According to the net effective forcing data (and the model simulations presented later in this post), the rate at which surface temperatures warmed during the late warming period should much higher than during the early warming period. But it’s not. The two periods warmed at similar rates. This was discussed in more detail in Section 2 of my book. In fact, Figure 2 above is an updated version of Figure 2-17from the book. HOW WELL DO THE IPCC’s CLIMATE MODELS HINDCAST AND PROJECT POLAR AMPLIFICATION? One-word answer: poorly. I’ll leave it up to readers to come up with a two-word answer. 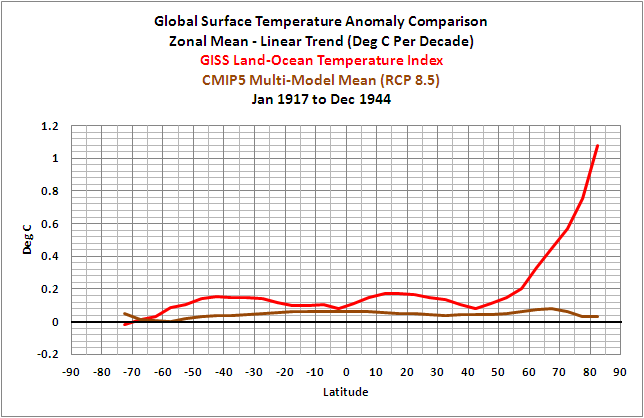 We’ll compare linear trends (deg C/decade) of the GISS Land-Ocean Temperature Index (LOTI) data and the simulations of global surface temperature by the multi-model ensemble mean of the CMIP5-archived coupled climate models that have been prepared for the upcoming 5th Assessment Report (AR5) of the Intergovernmental Panel on Climate Change (IPCC). I’ve used the RCP 8.5 scenario hindcast/projection since it was simulated by the most models and since it is similar to most of the other scenarios during these periods. 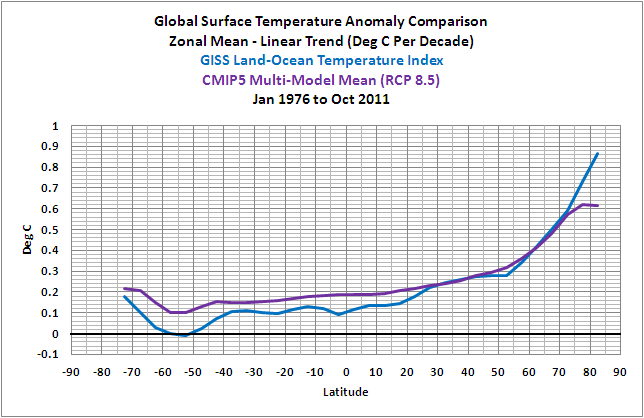 See Preview of CMIP5/IPCC AR5 Global Surface Temperature Simulations and the HadCRUT4 Dataset. And again, we’ll use the zonal-mean graphs. 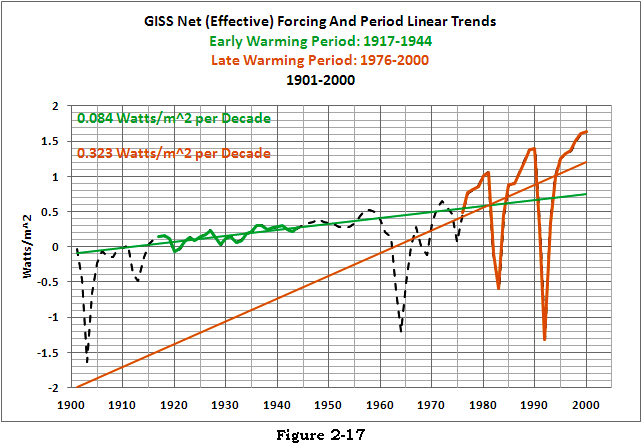 As shown in Figure 3, the models do a good job between the latitudes of 30N to 70N of simulating the rates at which global surface temperatures warmed during the later warming period (1976 to present). They underestimate the warming north of 70N and, for the most part overestimate the warming south of 30S. For example, at the equator, the models are hindcasting/projecting warming that is about 1.6 times higher than the rate that’s been observed since 1976 [(0.186 deg C/decade)/( 0.113 deg C/decade)] . During the mid-20thCentury “flat temperature” period, Figure 4, the models do reasonably good job between the latitudes of 60S-60N, but fail to capture the observed warming of the Southern Ocean and the polar-amplified cooling over the Arctic. 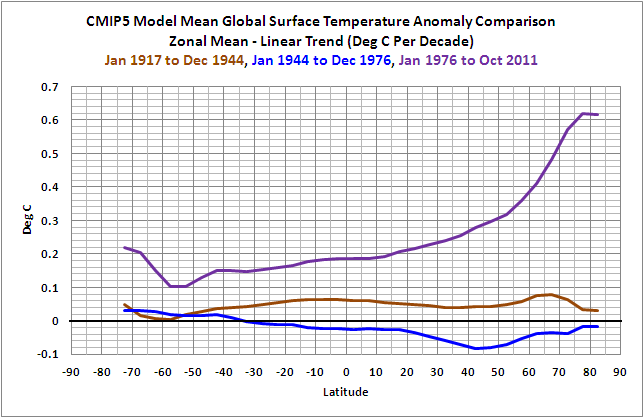 And for the early warming period, Figure 5, the models are not simulating any polar amplification. They missed the boat during this period too. And for those interested, Figure 6 compares the trends of the simulated warming rates for the three periods on a zonal-mean basis. The brown curve of the early warming period should be similar to the purple curve of the late warming period. This post was just another way of illustrating that the climate models employed by the IPCC show no skill at being able to simulate the surface temperatures experienced over (nearly) the last century. We’ve illustrated and discussed these failings numerous ways in past posts. Refer to the other IPCC model-data comparisons at my blog or in my book. As illustrated and discussed in If the IPCC was Selling Manmade Global Warming as a Product, Would the FTC Stop their deceptive Ads?, the IPCC’s climate models cannot simulate the rates at which surface temperatures warmed and cooled since 1901 on a global basis, so their failings on a zonal-mean basis as discussed in this post come as no surprise. Additionally, the IPCC claims that only the rise in anthropogenic greenhouse gases can explain the warming over the past 30 years. 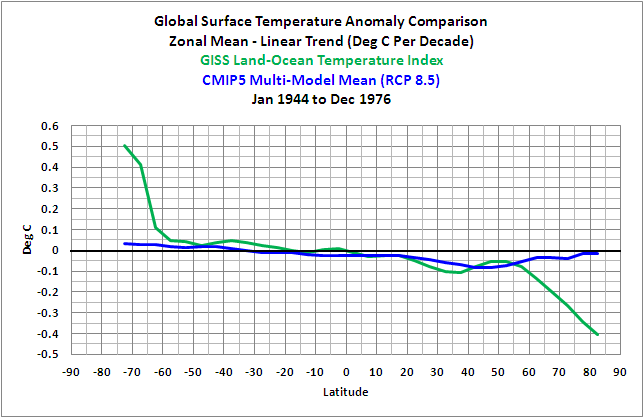 Satellite-based sea surface temperature disagrees with the IPCC’s claims. Most, if not all, of the rise in global sea surface temperature is shown to be the result of a natural process called the El Niño-Southern Oscillation, or ENSO. This is discussed in detail in my first book, If the IPCC was Selling Manmade Global Warming as a Product, Would the FTC Stop their deceptive Ads?, which is available in pdf and Kindle editions. A copy of the introduction, table of contents, and closing can be found here. This entry was posted in Climate Model Problems, Model-Data LOST, Polar Amplification. Bookmark the permalink. There is of course no real ‘discovery’ here. It’s all quite natural. But this aspect still seems to get very little attention, if any at all. Kristian: Thanks, That’s a good idea for a post, because I doubt many people are aware of it. I’m just about done with my book about ENSO. Hopefully, I’ll remember to put together a post about the differences in Polar Amplification in a couple of weeks. Pingback: Greenland Near-Surface Land Air Temperature Data from Berkeley Earth Present Some Surprises | Watts Up With That?